When I set out on a backpacking trip or even a day hike, my mind jumps forward to the views I will see, the interesting things I might find, and the serenity I know I am going to feel from communing with nature. Like most people, thoughts of disaster, plans going awry or getting stranded are far from my mind. Though it isn’t healthy to be constantly thinking of doom and gloom, there is a problem with the opposite mindset as well. If we never think about potential problems, how will we ever be prepared when they happen? Disasters can often turn into tragedy when unprepared people embark on a journey that they think will be quick and simple. Simple day hikes can turn into survival situations if even just a few things go awry, such as a car breaking down in a remote area, getting lost, sudden, severe weather changes, etc. That is why I recommend carrying the items from this survival essentials list even during short hikes, and definitely during longer trips. It is always better to be prepared and not need to use the gear than to need it and not have it. The following list is known as the 10 essentials, and as the name implies, each of these things is crucial to have in a survival situation. Each number on the list can be regarded as an important category related to survival with some specifics in parentheses. The above list is a helpful starting point. But it can still be confusing to know exactly what you should put into your essentials kit. So let’s take a look at each number, one at a time. I use my phone or a handheld GPS for navigation far more often than I use a compass. However, we’re preparing for unexpected, and unplanned potentially dangerous situations here. So let’s think about what could go wrong if you are relying on a cell phone or GPS to navigate while backpacking. The big issue: batteries. Your phone battery or GPS could conk out and then you could be completely lost. Also, a GPS is not perfect and they have been known to malfunction and lead people astray. 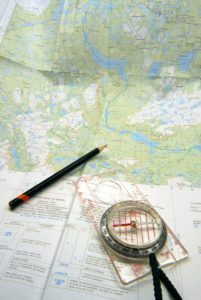 Having a good map of the area and compass, and knowing how to use them, is an excellent backup. Click here for a refresher on how to use a compass, and here for tips on topographic map reading. You can also carry brightly-colored surveyors tape also known as flagging tape. If you are trying to find your way, and suspect you may need to backtrack you can tie the flagging to a branch so that you will be able to return to that area. Flagging can also help rescuers follow your trail. This one is pretty self-explanatory. At the minimum, I would take a hat, sunglasses, sunscreen, and a bandana. As an added bonus, bandana’s have many other uses such as collecting kindling for a fire. This category is largely dependent on the type of weather you are expecting and may change accordingly. If I am heading out on a winter hike, I will definitely have a lot more included in my insulation category. You will want a flashlight or headlamp in your emergency kit. I prefer a headlamp because it allows you to use your hands for other things. And don’t forget the extra batteries! This category also includes signaling essentials which can help you be found by rescuers or anyone who may be searching for you. A loud whistle is excellent. You can also pop in an old CD or DVD which can be used as a signal mirror. I carry some basic first-aid supplies in my survival kit. Some things I include are basic pain-killers like ibuprofen and Tylenol, allergy pills, antiseptic wipes, bandages, medical tape, gauze, tweezers, and safety pins. For more details on assembling a first-aid kit click here. The ability to start a fire is very important. If you were stranded on a cold night, fire not only helps keep you warm and avoid dangers such as hypothermia, it can signal others to your location. You should carry both fire-starters and small fuel sources. These items are small so you should carry a few different types. You’ll want a good knife. It’s always good to have a fixed, steel bladed knife with a tang that goes all the way through the handle. Pocket multi-tools can be convenient but they can break more easily and the blades are often too small to be of any real use for cutting branches or carving. Cordage is very important as well. Pick up 100 feet of 550 parachute cord. You can purchase this in a small bundle almost anywhere, including your local Walmart. And pop some unwaxed dental floss in there. You can use this for stitching small things, or as fishing line, etc. Heavy Duty freezer bags can also be useful for water carrying. 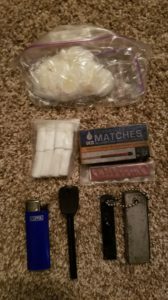 Stick a quart size and a gallon size bag in your kit. And you can never go wrong with Duct-tape. You can wrap duct tape several times around a water bottle, to be used when needed. I never go anywhere without at least two granola bars. Make sure you have some in your kit! Or protein bars, candy bars, anything works as long as it can provide you with a few calories to keep you going when you need it. This is the most important item on the list. You should bring water with you, but you should also have the ability to get more water from natural sources. I don’t hike without carrying at least 2 quart-sized water bottles filled with water. You can also include a collapsible water container in your kit. These don’t take up much space, so why not? Throw some iodine tablets in there while you’re at it. 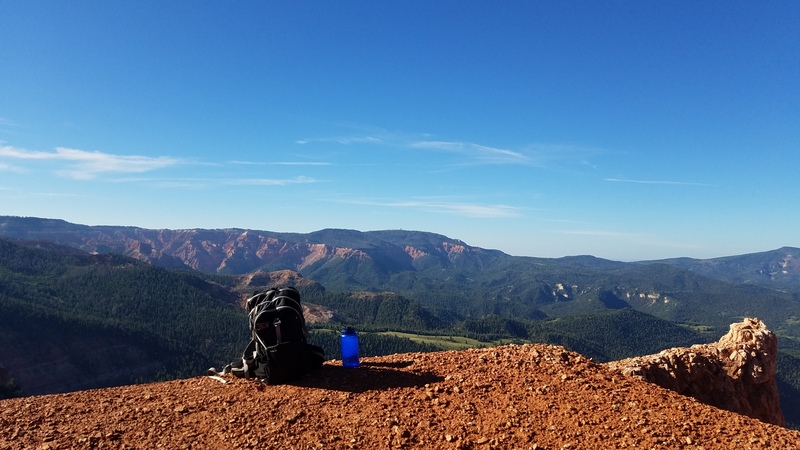 I usually carry my Sawyer water bottle filter, along as well because it’s so easy to use, but it’s not required for your kit if you’ve already got another way to purify. This is perhaps the second most important on the list after water. Don’t worry I’m not telling you to carry a tent with you wherever you go. You’d be surprised at how little you need to make a useful shelter. You can find emergency space blankets in the camping section at Walmart, they are only about 2″ X 3″ and weigh almost nothing! Definitely get one for your kit. You can also add a more heavy-duty space blanket as well. Many of these have grommets on the corners so you can tie them up like a tarp if needed. If you’ve got a little extra space, why not include an actual 20ft tarp? These are very lightweight and combined with your paracord from number 7 above can make all types of excellent shelters. Large heavy-duty trash bags or an emergency poncho can also be used as inexpensive, lightweight shelter material. I’ve been carrying all this stuff around with me for a few years and believe it or not I got into a bit of a survival situation just a few weeks ago. 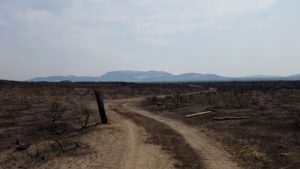 I was working on a vast area of land that had been burned by a huge wildfire. It was the middle of summer in the Southern Idaho desert. All there was for miles around was the burnt stubs of what used to be sagebrush plants and ash. My crew and I were surveying the burnt fence line on ATV’s. We had divided the land and separated to survey our sections. A few hours into the day, right around the hottest part, my ATV overheated and conked out. I was stuck in a burned wasteland with no shade for miles around. Luckily I had cell phone service so I was able to contact a crewmate and send him my location. It was slow going in the trackless desert and my crew mate was a few miles away so I settled in to wait. The sun beat down overhead with its unrelenting rays and It quickly began to burn. I was so glad to be carrying some trusty survival supplies, including sunscreen, lots of extra water, granola bars, and a hat. But most of all I was glad I had an emergency poncho and a rain jacket. You might be thinking to yourself how ridiculous that sounds. There was not a cloud in the sky and I would have welcomed the chance to get drenched in rainwater. 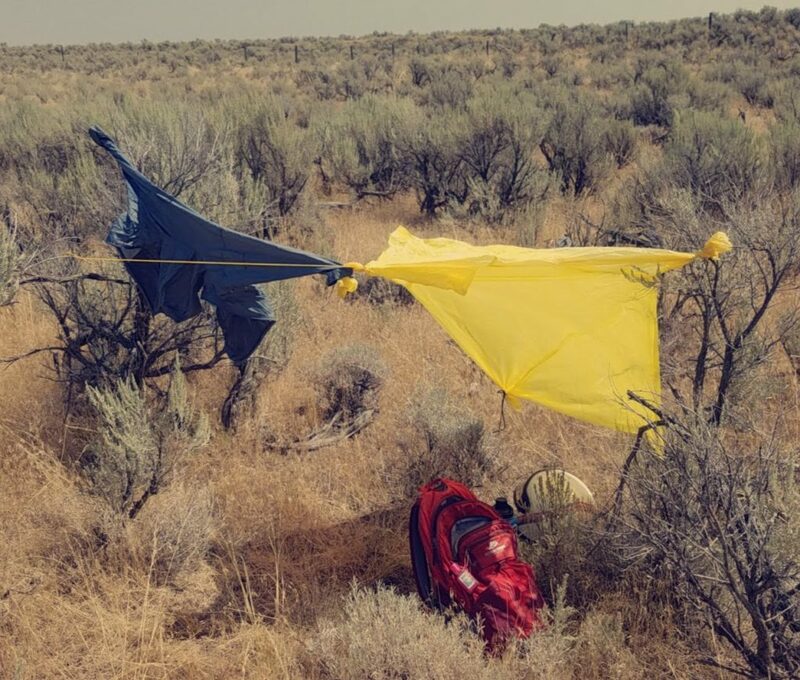 But I tied the ends of the poncho and rain jacket to a couple of shrubs in an unburnt sagebrush patch and managed to get a little square of shade just big enough to lay down under. It may not seem like much, but I can tell you the difference between the shade and when I poked my legs out into the sun was immense! The 50 cent poncho saved me from a few miserable hours in the beating sun and actually made waiting quite enjoyable. My crew mate got a flat tire on his way to come to rescue me which prolonged the sun exposure. Now, in this instance I would have survived without the shelter I rigged up. I could have even walked back to our truck which was only a few miles away if I had to. But boy, am I glad I had the ability to create myself some shade. And I know that if the situation had been worse, I had all the supplies I needed to get out in one piece. We have so many wonderful safety professionals who are willing to put their lives and comfort on the line to help others. Policemen, firemen, paramedics, search and rescue personnel, the list can go on and on. But the truth is, you are ultimately responsible for your own safety. As you assemble this survival kit and learn to use its contents you will take your safety into your own hands. These items will help you be a more self-sufficient backpacker and are useful to the complete greenie as well as the most experienced two-foot traveller. Remember, preparation is the antidote to disaster. Have you ever found yourself in a survival situation? If so let me know how it went in the comments below. And as always, if you have any questions feel free to ask. What a great guide–now I want to go hiking! I am glad you had everything you needed when you got stranded in the heat! I like the idea about duct tape on the water bottle, I’ve never thought of that before! It’s definitely the best way I’ve found to store duct tape without having to pack a big heavy roll. Wow, amazing, You just ignite my adventurer spirit. I loved your article, special thanks for the list, can I print it? I like it I think is very detailed. I like to go camping, I learned from my father. I just wanted to let you know that I have added a printable PDF version of the survival checklist. I hope you will take a look at it! I wish you success in assembling your survival kit. Loved the article. I totally agree that small things like this can make all the difference in the world. As for myself, I haven’t yet been exposed to really any survival situations like you had, but I truly plan to take on hiking, so I bet I will be. Thank you for the guidance, I appreciate it! And I will definitely print the Quick Reference Survival Checklist for myself, it’ll come in handy. Glad you enjoyed it! Hopefully, you won’t get into any scary, survival situations anytime soon. Great post about how a little thought and a little preparation can divert disaster. I think the older i get, the more I realize that everyday there is always a chance for something to go wrong. I love your Survival Essentials List and I found this whole article very helpful. Thanks for reading! I’m glad you enjoyed it. I just added a printable PDF version of the survival checklist. I hope you will take a look at it! Love this! Can’t wait to read more. This is a brilliant how to guide and very necessary in today’s world. It is really good that you are building awareness keep up the good work. Wow what an awesome and in depth guide! Thank you for providing this extensive list of survival essentials! I definitely have to bookmark your site and come back to this list when I go travelling again. I also really like your images. They remind me of my travel experiences. This has been a great guide for people who like to go camping or take great walks through the forest. I´m not a person who has done this kind of activities, but I have always wanted to make an excursion soon. Just as I´m a person who never went on a excursion, I didn´t know about the essential survival list either. I imagine that in real life when you get at a moment of emergency and to see that you don´t have what you really need, it must be a desperate and horrible feeling. Definitely if I’m hiking with my wife, I’ll take your advice into account. What a fabulously well-written and organized brief you’ve put together. You should be an instructor – you’re certainly armed with first hand knowledge. So glad you were able to use that 50 cents wisely – eh? If I were ever out two footing it – you would be my top choice for guide and safety. Thank you for such an informative and insightful post! I’m flattered Sharon! Thanks for giving my article a read. what a great post, all to often people go trekking without the proper equipment. You have shown how easy it is to put a kit together so in my view there is no excuse. I agree with what you say about it’s better to have the equipment and not use it rather than needing it and not having it. It’s great your raising awareness especially for novice hikers who aren’t aware of the dangers, especially with the weather. I’m the kind of guy, who tends to suppress any potential danger could ever happen to me. Your article is like a wake-up call for me. Especially when you travel with kids (like me), every adventure trip should be prepared carefully. Your list of survival essentials is much appreciated here. Your little story gives a perfect example, what a difference a few simple items can make. Better safe than sorry, though cliche, is definitely a true statement in cases like these! Survival Essentials list is the perfect article to take on the road. You can take this list anywhere with you still be able to survive. Because this survival essentials list has everything you need to be out in case of emergencies or just in a total blackouts you still have all the tools and equipment to make the best of any situation. All you need to do a just update on your essential survival list and you will be a okay. I really love this informative article it gives great information on how to be prepare.